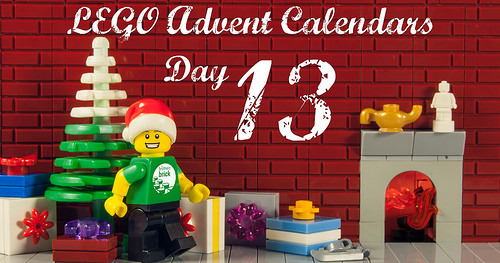 Welcome to Day 13 of our LEGO Advent Calendar countdown. Each day, we’ll reveal the three mini-builds from the LEGO City, LEGO Star Wars, and LEGO Friends 2017 advent calendars along with commentary from our team. If you’re opening one (or more) of these advent calendars along with us, we’ve made sure the pictures and commentary on each day’s models will be behind a jump and posted in the evening every day, so we don’t accidentally ruin the surprise. Will Day 13 be routine? 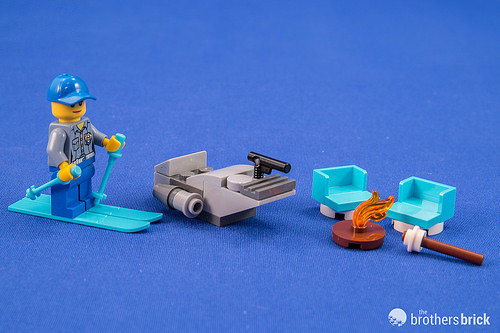 For Day 13, we have a Coast Guard minifigure on skis from City, a First Order Snowpeeder from Star Wars, and chairs and a fire pit from Friends. Chris: These are all oddly well-themed. We get a nice City skier with medium azure blue gear, and matching chairs to go around a campfire from Friends. Even the Star Wars craft, a First Order Light Infantry Utility Vehicle (aka First Order Snowspeeder) is appropriately snow-themed. This is the third time this vehicle has appeared in LEGO form, even though the only scenes in which it appears were cut from The Force Awakens. Edwinder: We can actually see how irresponsible our little Friends are. They’ve disappeared to go have fun and left a flaming pyre to just burn dangerously. I really hope that Star Wars vehicle looks like it could have a water jet spray to hose it all down. We have to thank City dweller Frankie for swooshing in to save the day. I can’t imagine how someone could ski in those summer clothes, though. Daniel: Frankie is clearly cross-country skiing, which explains her light layers. The azure combo is both stylish and somewhat surprising. Almost like the teams were designing these kits to go together. Either that, or there is an excess of azure parts at the LEGO warehouse. Andrew: I don’t think anybody would complain about an excess of azure! And that’s a rather excellent First Order snow speeder. Luka: The Friends mini-set is actually the best this time! 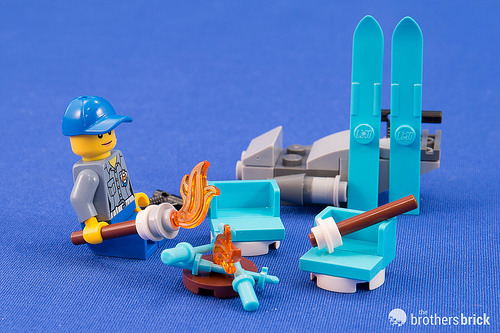 The skis and sticks colours are an interesting choice for City, and the minifig is good. The Star Wars model is neat and it has good pieces, but I do not like it very much personally. Edwinder: Well, at least Frankie has it all under control now, and she might as well enjoy a bite while she’s at it. Daniel: Frankie knows that a burnt marshmallow is the only way to go. Also, it seems that maybe she prefers snowboarding, based on how she feels about those ski poles. Andrew: Frankie is a pyro! Or she just doesn’t like being forced to go skiing. Elspeth: Frankie’s carbon ski poles were proving to be rather poor tinder for the fire. Luka: When you are baking marshmallows over plastic, no wonder they get blackened quickly. Dave: It feels like these three mini-builds were meant to go with each other. I love a bit of unintentional cross-advent product congruence! OK, I did not get any of those advent calendars but I really enjoying these posts, especially the mashups. Why use skies when you can take the snowspeeder? Does anyone find it questionable that there are _two_ chairs for roasting marshmallows, but only one Friend and one (official) marshmallow in a stick? Did some misdeed happen to the other Friend over a stupid marshmallow?